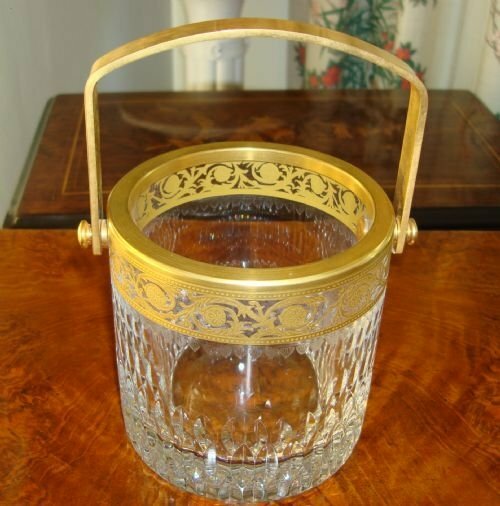 Pristine world famous quality St Louis French crystal thistle gold pattern gilt embellished ice bucket or wine cooler. 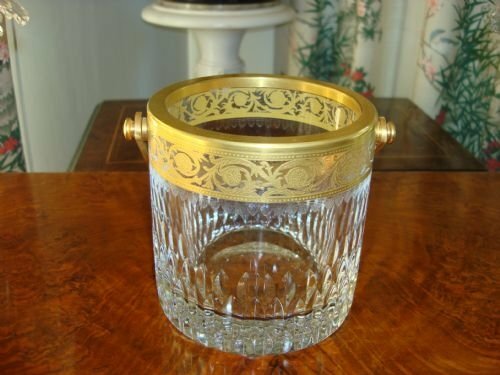 Stunning St. Louis French crystal mouth blown, hand cut and engraved ice bucket or wine chiller with 24kt gilt embellishment and detachable gilt metal swing handle and rim, in the coveted Thistle Gold pattern. The pattern has a beautifully cut glass body, leafy engraving as well as an open gilt border to the rim. Cristallerie-St. Louis is the world famous glass house in France, makers of the finest crystal and suppliers to French kings. 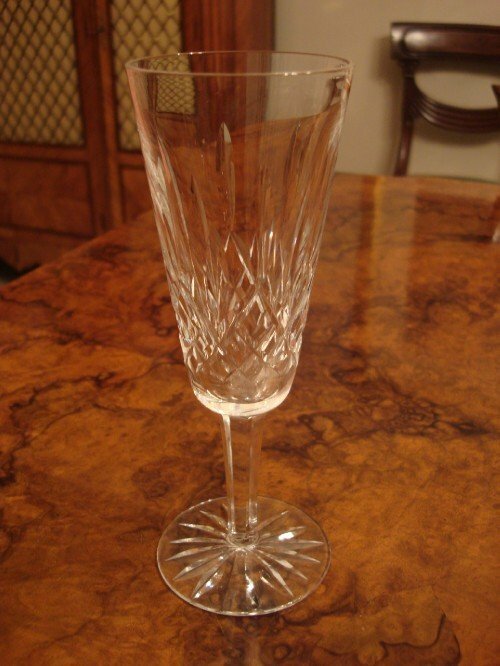 Active as glass makers since 1586, they have been recognised for their superior craftsmanship. This pattern, first made in 1913, is one of the Cristallerie's most exclusive patterns. It has graced many Presidential dinner tables for official occasions. Each piece takes 25 days to make; 10 glass blowers shape the piece, and then 15 other specialists hand cut, engrave and decorate it. The fine 24kt gold pattern is painted on with a small brush and then fired and polished with agate stone. This is a heavy and beautifully cut piece that will be the star of a dining table or bar, or make a unique gift. 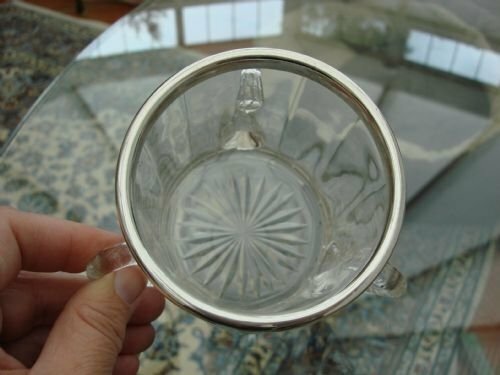 The acid etched mark for St. Louis Crystal France, is found on the base. Size-4.75 inches high without handle and 7.5 inches high including handle by 4 5/8 inches outside diameter, and 3 7/8 inches inside diameter. Interior depth is 4 inches. Saint Louis glass pieces, made by master craftsmen, are as elegant and traditional today, as they have been for centuries. 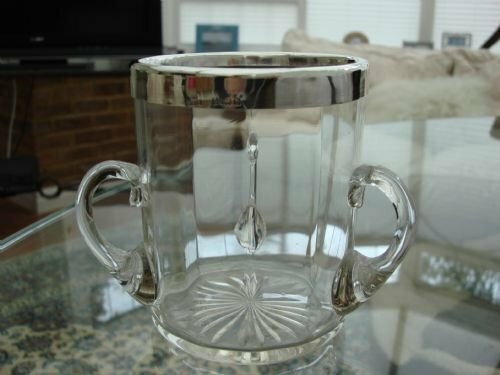 This opulent and breathtakingly beautiful piece will hold ice cubes or a bottle of wine for chilling. 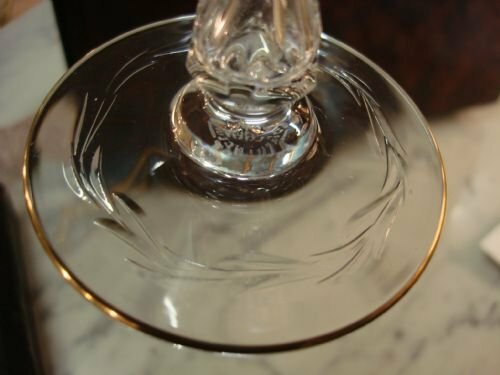 See listings for a matching champagne saucer/tall sherbet glass in this same pattern, as well as a special St. Louis goblet in a cut and engraved pattern. In very good condition, and a wonderful value at £445.00. Retail value is £800.00-£900.00 if it is even possible to find other available examples. 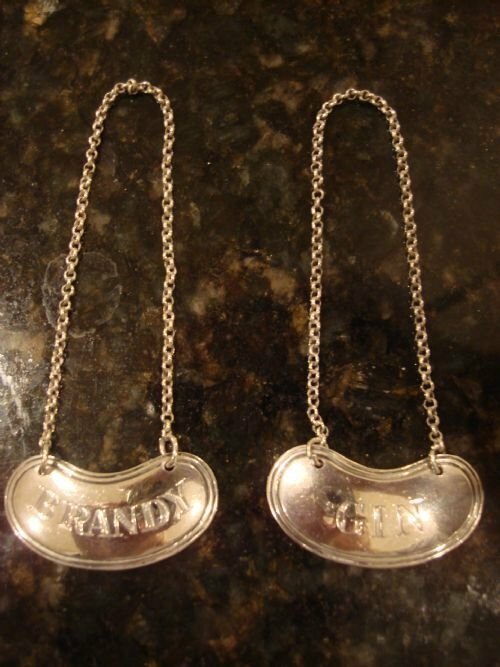 This would make a treasured gift and a wonderful treat for yourself. London 1975 pair of generous solid silver bottle coasters with turned wood bases. 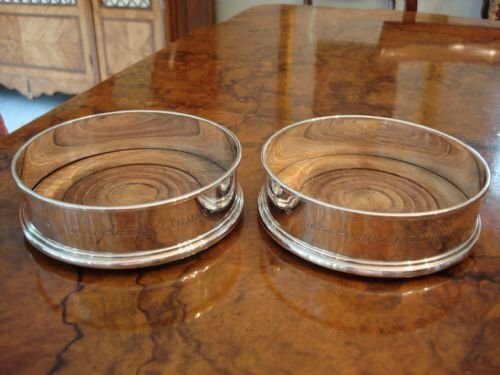 London 1975 English hallmarked solid silver pair of wine or champagne bottle coasters with solid sides having turned over top edge, and flaring curved stepped base. The centre base is turned wood. Made by Richards and Knight. 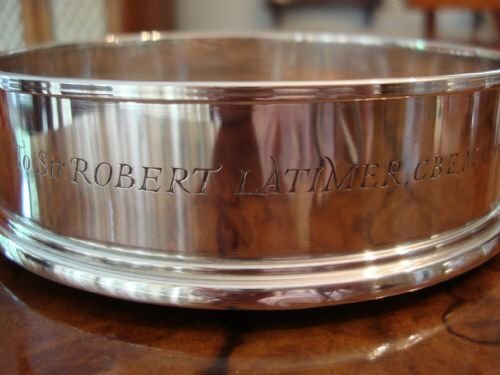 This lovely pair is engraved around the sides "To Sir Robert Latimer, C.B.E M.A., with the gratitude & affection of the Governors of the Kingston Polytechnic 1970-1976." Sir Latimer was the registrar of the school. Size-5 1/8 inches diameter by 1.5 inches high. 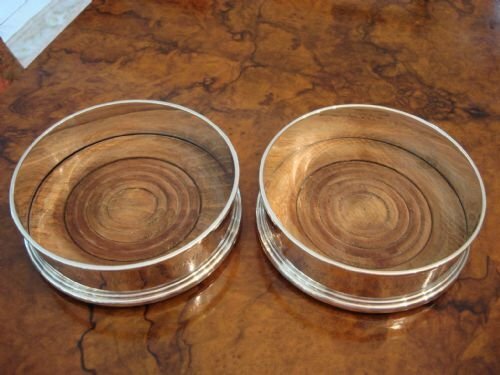 A very nice and functional pair of wine coasters in very good condition. 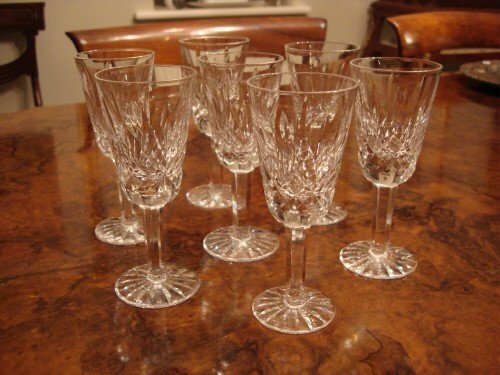 20th century set of 7 Waterford Lismore pattern white wine glasses. Lovely 20th century famous Waterford Irish crystal set of 7 white wine glasses, in the Lismore pattern with beautiful cut glass bodies, cut stems, and star cut bases. 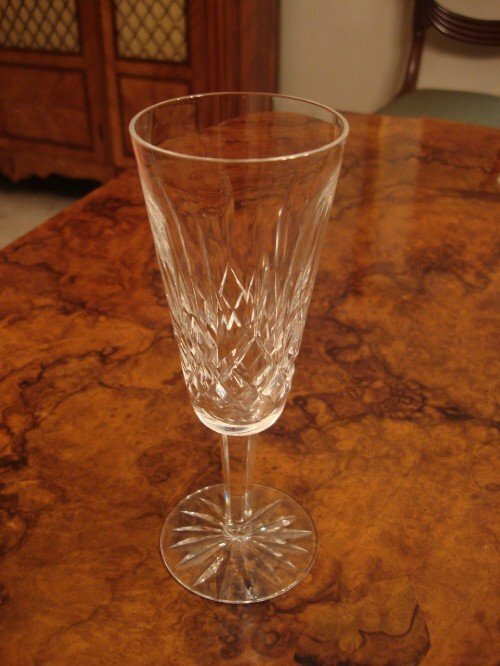 Lismore is one of the oldest and most iconic Waterford cut glass patterns. 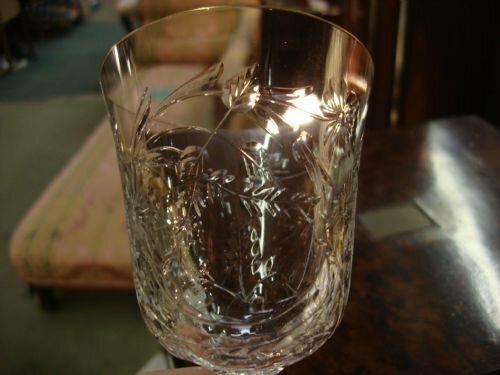 Waterford is known for its fine quality and clarity, and superb glass cutting. The size is suitable for port or sherry as well. Size-5.25 inches tall by 2 1/8 inches diameter. 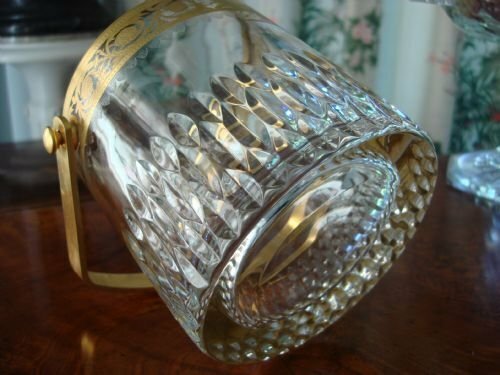 A beautiful and heavy set of glasses, made by a famous maker, in very good condition. 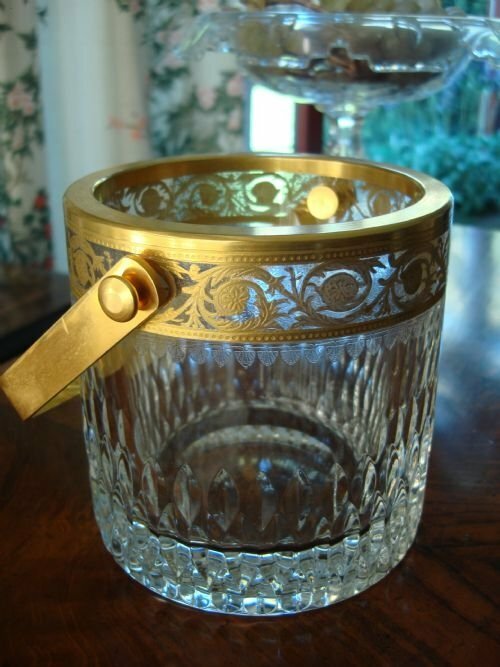 A wonderful addition to the bar, or drinks cabinet, or excellent to keep on a silver tray in a gentleman's study. 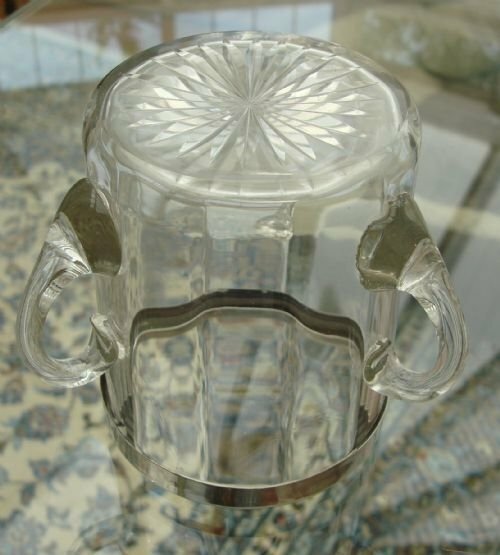 Several suitable cut glass decanters are also available if desired. 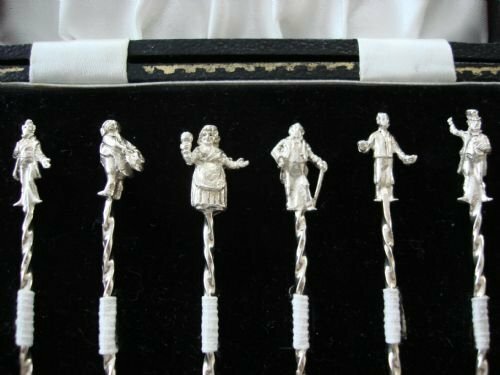 Cast solid silver cased fruit or cocktail sticks in original fitted case. 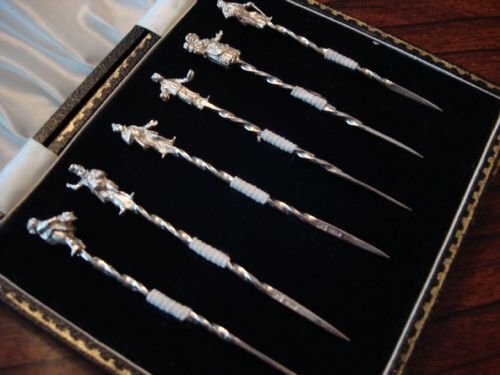 English hallmarked Birmingham 1966 solid silver seal topped set of 6 cocktail or fruit sticks in the original fitted case, made by Bishton's Ltd of Northampton St. in Birmingham . 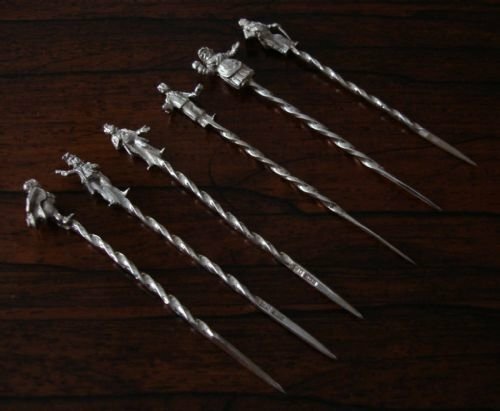 These are a much heavier weight of silver and are longer than other examples. Other examples are often flimsy and thin. 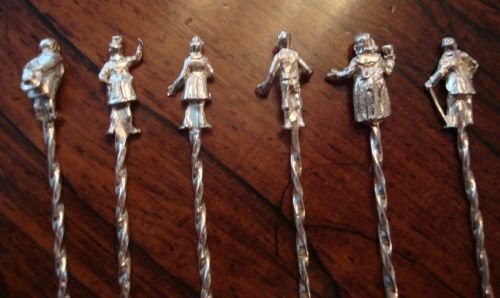 The design features cast silver Dickensian characters topping long twisted sticks. The characters portrayed are designed from original illustrations from Dickens novels: Mr. Pecksniff, Sairey Camp, Oliver Twist, Mr. Pickwick, Captain Cuttle and Mr. Micawber. Wonderful to use at the bar to spear cherries, olives, and onions for drinks, or to serve with fruit or cheese. 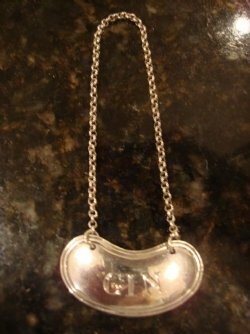 Weight-60 grams silver only, and 200 grams with case. 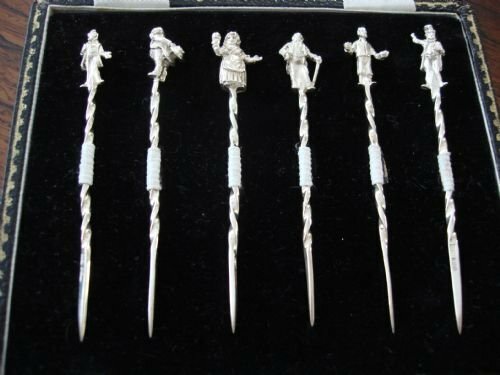 A lovely set in very good condition which would make a great wedding, Christmas or house warming gift. 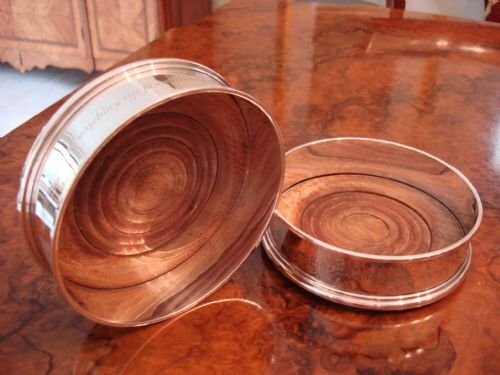 Please also see other great gift options on www.serpentineantiques.co.uk. 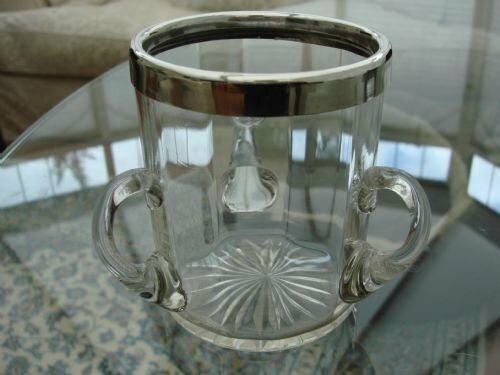 Birmingham 1901 wonderful and unusual solid silver and cut gass tyg cup, made by George Ernest Hawkins. Birmingham 1901 English hallmarked solid silver and cut glass very unusual tyg cup with elegant panel cut sides, three handles, star cut base, and silver hallmarked rim. Made by George Ernest Hawkins of Legge Lane in Birmingham. 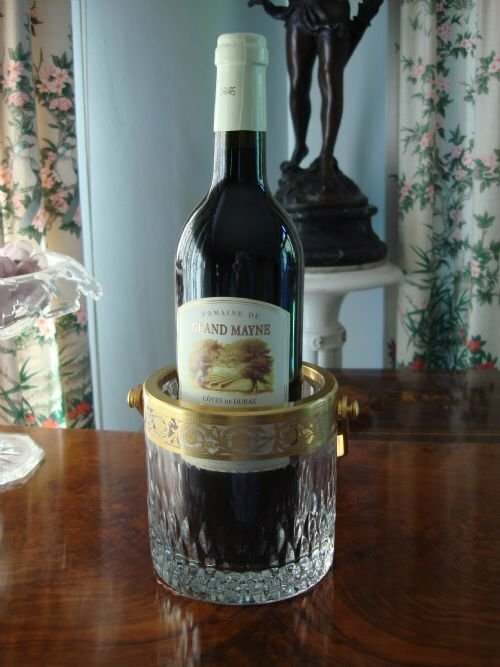 A tyg is a drinking vessel with multiple handles, allowing it to be easily passed around from person to person before a hunt or after a banquet, for toasting, etc. Size-3 inches diameter, 4 3/8 inches wide including handles, and 3 5/8 inches high. 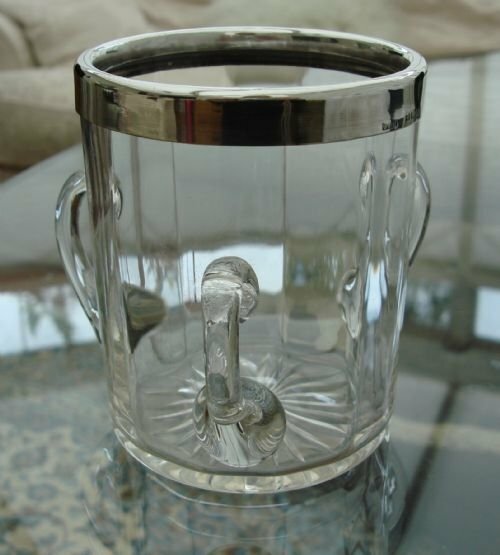 This is a really lovely cup in very good condition, and would make an ideal present for the drinking enthusiast, a collector, or for a child, Christening or wedding gift. 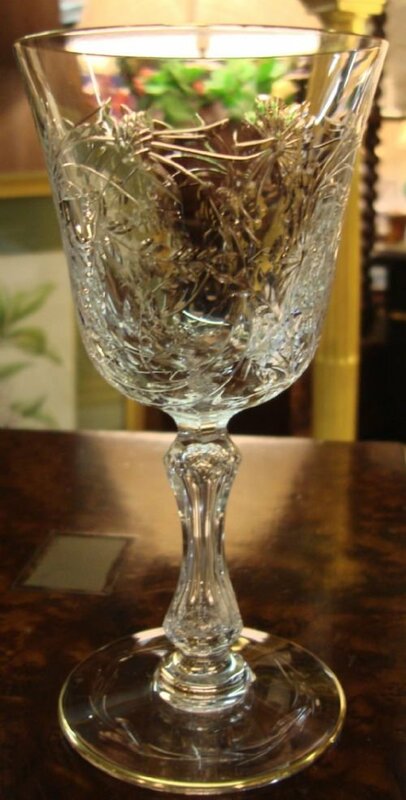 Superb quality St. Louis French crystal goblem with wonderful foliate design, by these world renowned makers. 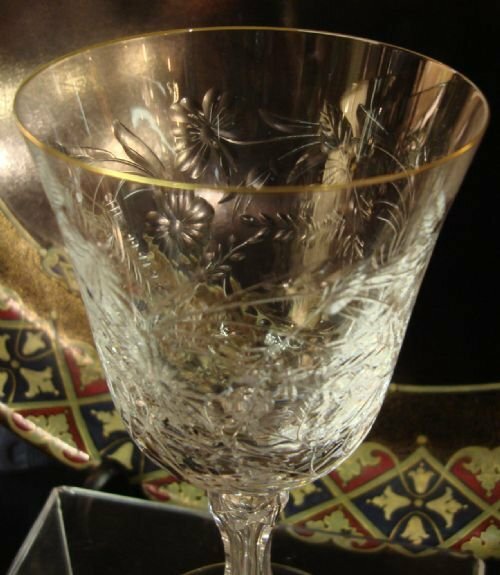 Superior quality St. Louis French crystal goblet with beautiful foliate cut and engraved body, cut and shaped stem, and a thin 24kt gold gilt border to rim and foot. The pattern name is unknown, but it is similar to the Botticelli pattern, but without the coloured accents. St Louis crystal is mouth blown and etched by hand by master craftsman. Cristallerie-St. Louis is the world famous glass house in France, makers of the finest crystal, and suppliers to the tables of French kings. 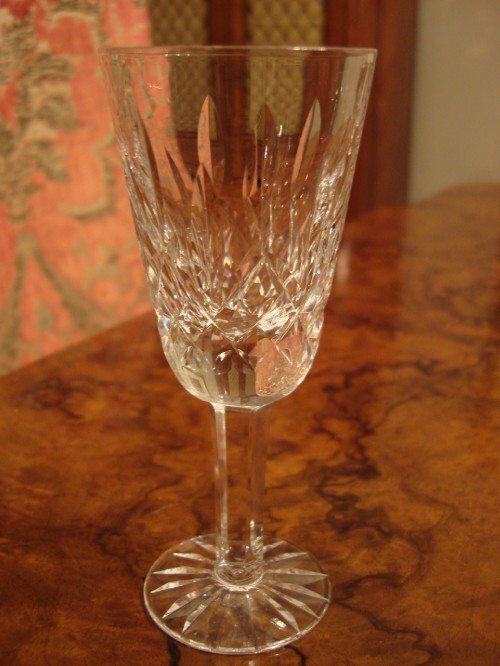 Active as glass makers since 1586, they have been recognised for their superior craftsmanship. 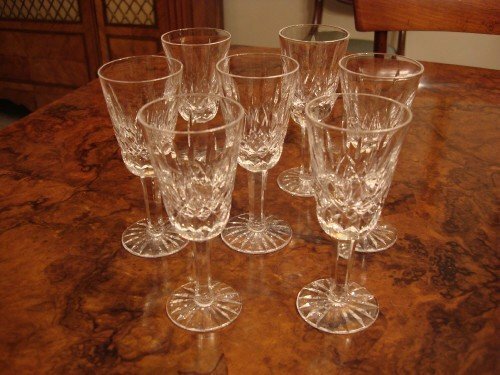 St. Louis glass has graced the tables of many heads of state across the world. 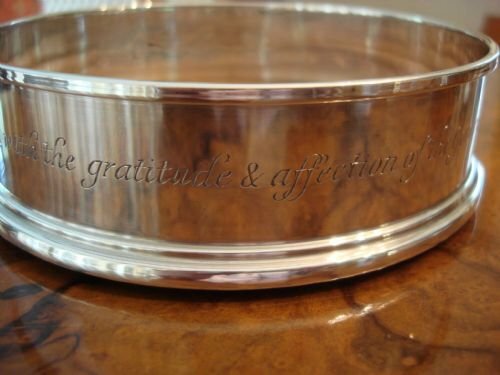 This is a heavy and beautifully cut piece that will be the star of a dining table or bar, add to a table service, or will make a unique gift. Size-6.75 inches high by 3 3/8 inches diameter. In very good condition without wear to the gilding, and a wonderful value. 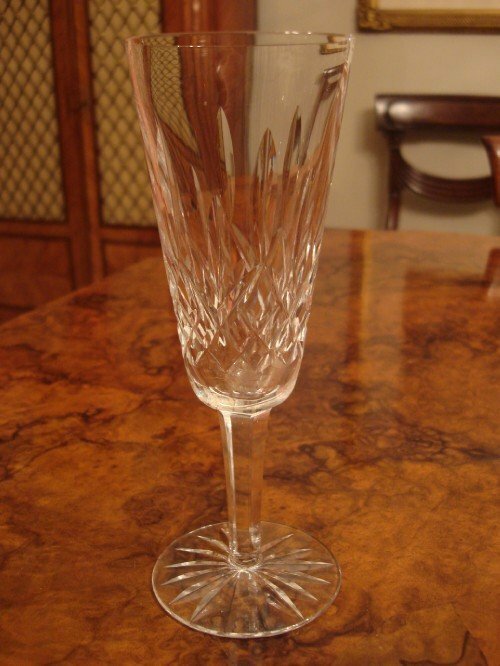 An opulent glass to give as a gift, or to add to a collection of other St. Louis glass. 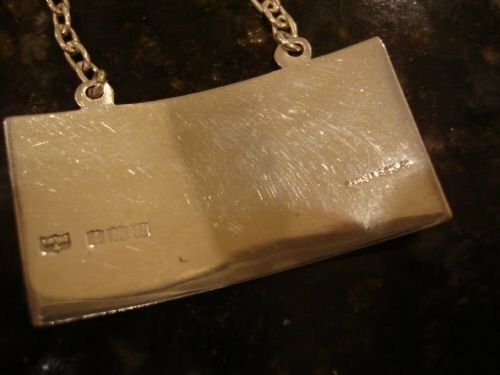 Retail value is at least £300.00 if another example could be found. 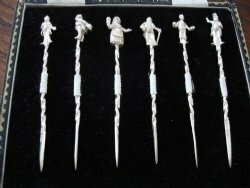 See listings on www.serpentineantiques.co.uk for other St. Louis pieces available. 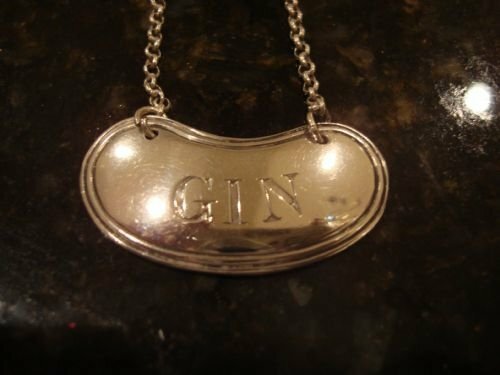 Sheffield 1898 Victorian hallmarked solid silver Gin spirit or decanter label by famous maker Harry Atkin. 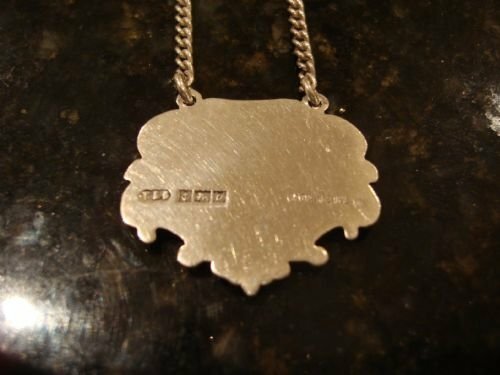 Sheffield 1898 Victorian English hallmarked solid silver Gin spirit or decanter label, made by Harry Atkin, famous and collectable maker. Kidney shaped label with threaded edge and very nice chain would make a nice addition to the bar or a great gift to an enthusiast with a bottle of gin perhaps. Size-1.5 inches long by .75 deep. Matching label with Brandy engraving available if desired. 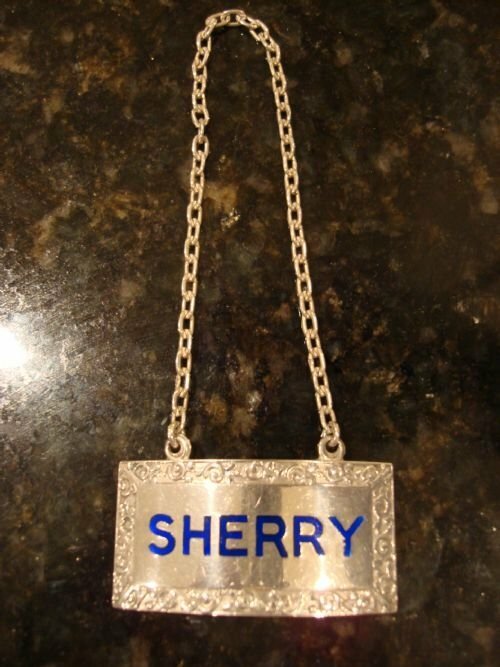 Superior quality solid silver Sherry label made by famous makers MAPPIN AND WEBB. 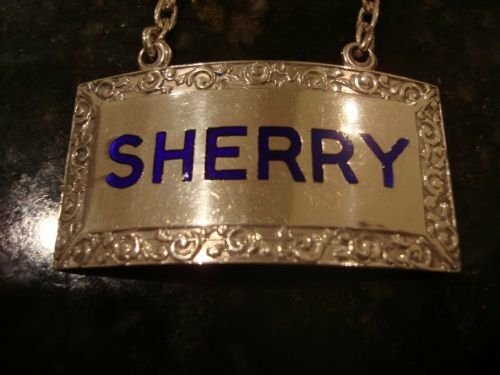 Birmingham 1969 English hallmarked cast solid silver and enamel Sherry label by famous makers, Mappin and Webb. A large and thick gauged label with lustrous cobalt blue enamel lettering, and scrolled edge. This would make a fabulous gift for someone, or an excellent addition to your own collection. Size-1 7/8 inches long by 1 inch high. Lovely Waterford pair of Irish cut glass Lismore champagne flutes. 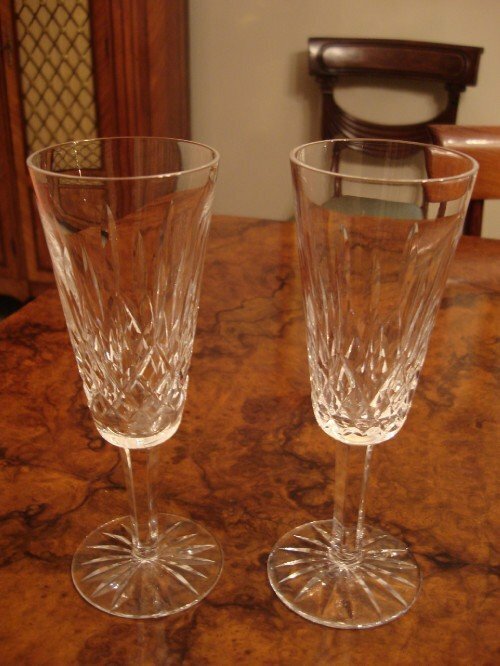 A beautiful pair of Waterford fine quality 20th century Irish crystal champagne flutes in the Lismore pattern. 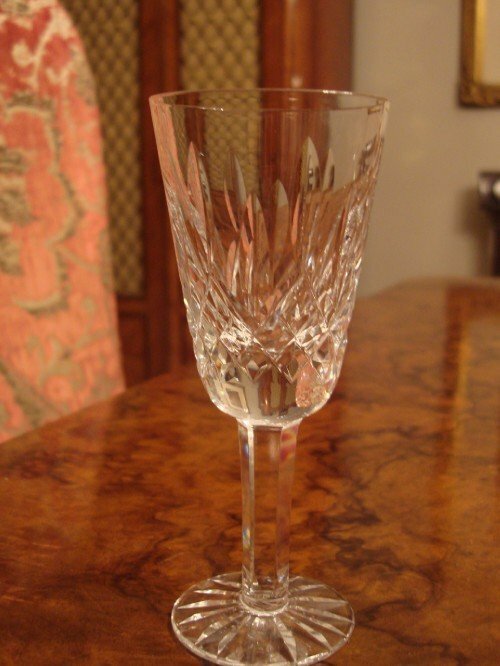 This pattern is the oldest and most iconic of Waterford patterns, and has very light catching cuts to the glass body, stem, and star cut base. 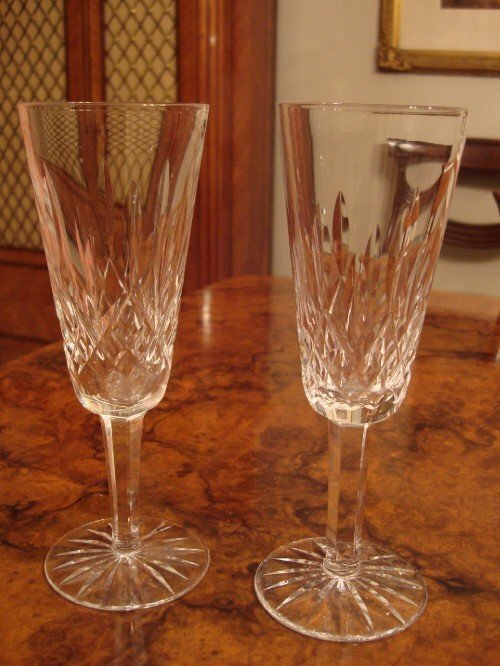 Waterford is heavy and very recognizable for its fine quality, clarity, and superb glass cutting. Size-7 3/8 inches tall by 2 5/8 inches diameter. Perfect to either add to a collection, as a romantic present for two people, or perhaps to give as a gift for any special occasion with a bottle of bubbly. 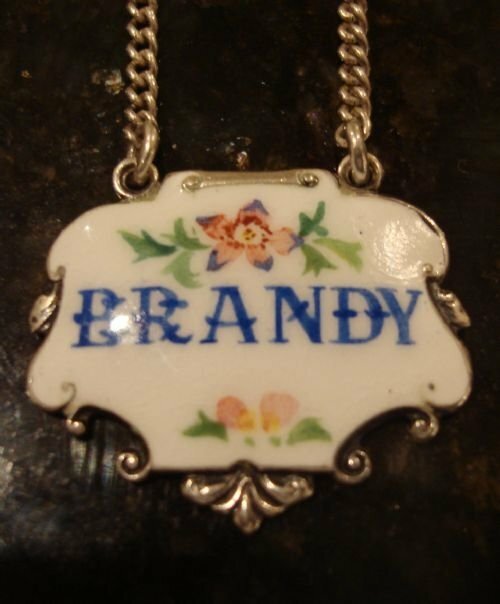 Birmingham 1963 solid silver and enamel Brandy spirit or decanter label made by Turner and Simpson. Birmingham 1963 English hallmarked solid silver and enamel Brandy spirit or decanter label made by Turner and Simpson, with painted and enamel decoration applied over the silver. 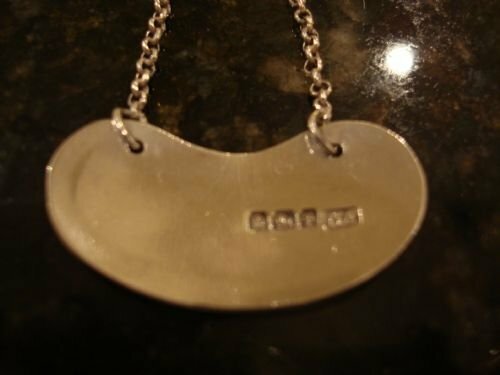 Size-1 1/8 wide by 1 inch high, not including length of chain. There is a slice of white enamel missing from the upper right hand corner as seen in photo, which is hard to notice, as it is part of the white ground. In otherwise, very good condition, and offered at a great value.